Have you considered the sartorial decisions one must make before partying in a graveyard? Do you wear fake blood and your palest makeup out of respect for the dead, or do you try your best to liven their spirits? Who's bringing the fruit punch and the mini sandwiches? And what sort of music might get them out of their six-foot holes in the ground and up moving again? Or have you ever wondered what might happen if you were to pay your friend to pour some neon rainbow-colored paint into an x-ray machine while you lay in it? Does it malfunction or continue scanning your bones as usual? Yikes, we're pretty deep down this rabbit hole. These questions might not even have answers, so we'll just stop. Oh, and for the record, we're not sure on the actual science of an experiment like that—but we think the outcome would look a little something like this toddler costume. 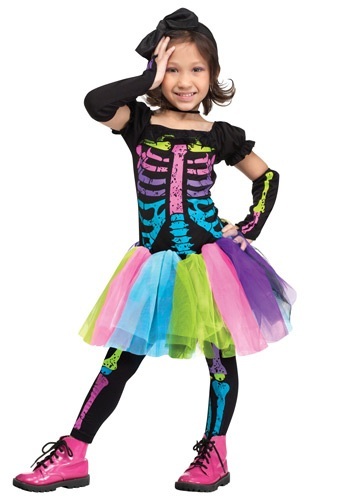 Now your little girl can bring a rainbow to the cemetery with this Toddler Funky Punky Bones Costume. It's a pullover dress with printed bones in neon blues, purples, pinks and greens, and the bones go all the way down the sleeves and to the footless tights! We kind of wish real x-ray machines would show bones in all these colors; it might make going to the doctor a bit more fun.